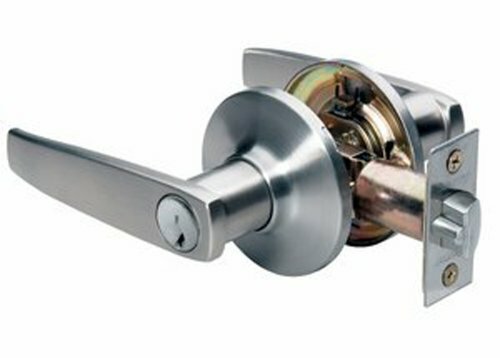 Master Lock SLL0115 satin nickel finished straight lever style keyed entry door lock. Six way adjustable latch fits all doors, 2-3/8-inch or 2-3/4-inch backset, square, rounded corners, or drive in.The SilvaBond antimicrobial protected finish has proved to be very effective in controlling bacteria, mold and mildew on surfaces. Independent laboratory testing has confirmed the effectiveness of this long lasting and durable finish.